Age: A known-age bird, this individual was banded in Door County, Wisconsin as a nestling. The overall appearance suggests a 1st cycle and the pointed primary tips reinforce this. Identification: In some ways, a 1st cycle California Gull may approach what we see here, but that species tends to have a longer and more tubular bill. The bill on our quiz bird is stout and widens at the base. Depending on the time of year, we'd expect a more sharply demarcated bill pattern for California. 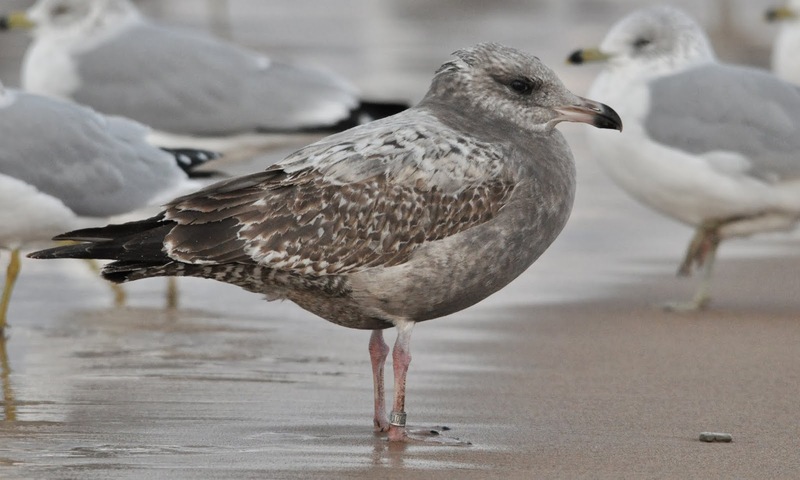 At this age, California Gull has a longer-wing appearance with an attenuated feel to the rear. The silvery 2nd generation scapulars are suspiciously similar to many Herrings at this age, and of course, that's what this individual is. Structurally, it looks fine for a Herring Gull. The solid brown wing coverts are a result of the feather edges fraying, which eliminates much of the pale edging we'd see soon after fledging. This individual was rescued by the Wisconsin Humane Society after being trapped in a deep windowsill between buildings. Luckily, it was soon released where it then made its way over to Berrien County, Michigan. It was banded as a chick on 24 June 2013. I photographed it in southwest Michigan on 07 December 2013.